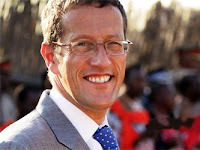 I will always remember the day the world went down the toilet because of Richard Quest. "Run for the hills, people! Grab your children and your cyanide pills. We're doomed. DOOMED!" Trust Richard to give me a good hard giggle when I should be rooting through my medicine cabinet to find those cyanide pills. And removing all my money from the bank. Thanks, Richard. You're a much needed tonic to all the worry about the economy tanking.